Inflammation in skeletal muscle in obesity. (A) In lean conditions, few immune cells with resting or antiinflammatory phenotypes reside in skeletal muscle. (B) As obesity develops and progresses along with expansion of visceral and subcutaneous AT, adipose depots expand between muscle fibers or surrounding muscle, so-called IMAT/PMAT. 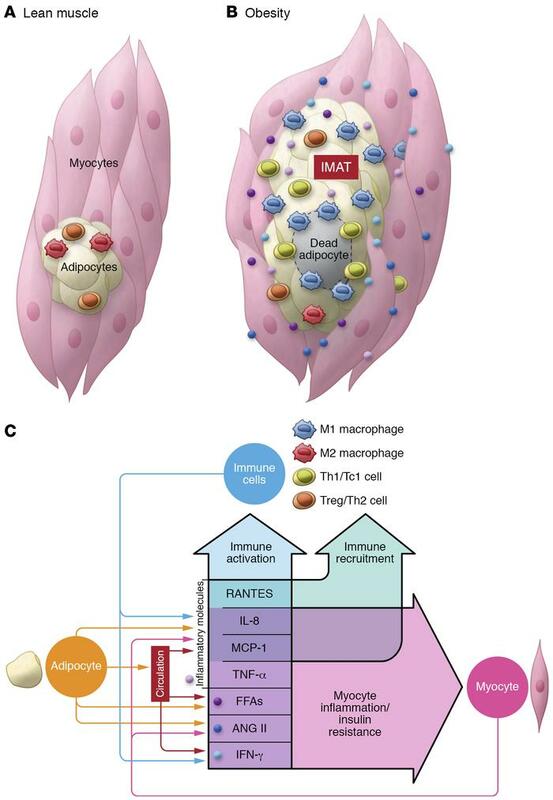 In obesity, immune cells including macrophages and T cells infiltrate into IMAT/PMAT and polarize into proinflammatory phenotypes, leading to increased inflammation in skeletal muscle. At the same time, myocytes may become inflamed and express proinflammatory cytokines and chemokines. (C) Chemokines and cytokines secreted by myocytes, adipocytes, and immune cells, along with FFAs that are transferred into skeletal muscle and ANG II produced within skeletal muscle, may themselves further accelerate immune cell recruitment and activation and myocyte inflammation, forming a feed-forward loop of inflammation in skeletal muscle.